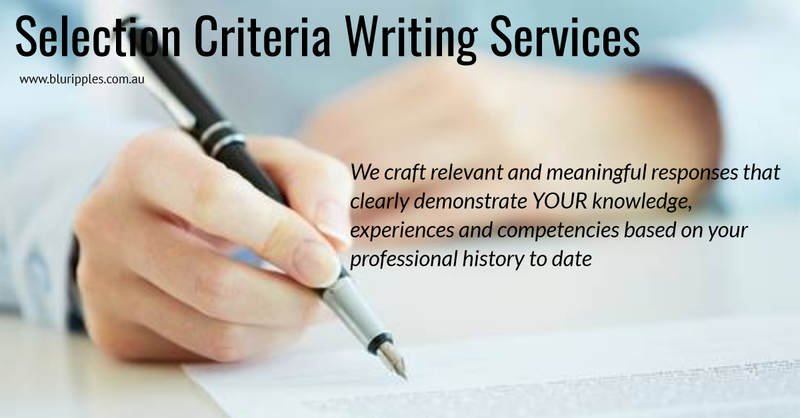 Blu Ripples Selection Criteria Writing Services will help you articulate your professional statements of claim(s) through the demonstration of your professional competencies, knowledge and experience. Working closely with our experienced professional Selection Criteria Writer, we will schedule a 1 on 1 verbal Selection Criteria consultation in which we will delve into and explore your professional and academic history in order to create tailored and relevant criterion that address the needs of the prospective employers. The length of the selection criteria consultation will depend on the number and complexity of the criterion to be written. Our Founder, Katherine Foster who has successfully penned thousands of selection criteria for clients across a broad sector of occupations, departments and agencies since 2003.
to pen your tailored selection criteria. Blu Ripples Selection Criteria Writing Services has penned Selection Criteria for a diverse range of clients including, but not limited to, Graduates, Professionals and Managers whom are seeking to enter, progress and/or transfer from one employment opportunity, department, agency or institution.